More portable but not quite as powerful as a Death Star, the G752VT is still a force to be reckoned with. [+] Galactic Empire: Good performance; G-Sync display; attractive styling; not too hot or loud. [-] Rebel Scum: Poor battery life; large and heavy; small 128GB SSD; middling M.2 SSD performance. You can almost picture the scene: the Dark Lords of technology showing off their wares, urging Asus to join the forces of Maxwell and Skylake to rule the mobile gaming universe. Unlike in the movies, Asus takes the bait and delivers their updated G752VT notebook. It's a technological marvel that's impressive on many levels, though you still have to watch out for that exhaust port weakness. Asus routinely offers true gaming notebooks—and by “true” we mean they go with the fastest graphics cards available, not lower tier parts with names that belie their performance (we’re looking at you, GTX 950M/960M). Having been a player in this arena for so long, you’d expect the well-oiled Asus machinery to crank out improvements every year. That was the goal with the G752, and it mostly succeeds… mostly. The ROG logo and racing stripes glow when the notebook is powered up. Packed inside this mobile Star Destroyer—the Death Stars of the notebook world use GTX 980 or at least 980M, after all—we have Intel's i7-6700HQ, 16GB memory, and a GTX 970M. The 6700HQ is plenty fast for a laptop, though it's technically the slowest of Intel's quad-core i7 offerings and runs at 2.6-3.5GHz. Asus also loses a few points by opting for the 3GB model of the 970M instead of the 6GB version; it's not a huge issue, however, since the GPU isn't really potent enough to properly utilize that much VRAM. But where we really take issues with the configuration we received is in the storage department. It’s 2016; can’t we expect 256GB SSDs as standard on any notebook that costs more than $1000? 128GB SSDs are so 2013, and it's a shame to see such a small OS drive. There are higher spec models of the G752 series with larger SSDs, but then you're looking at a $200 price increase (that's MSRP—at retail, it's more like a $350 price difference! ), and all you're getting is a 256GB SSD and 8GB more memory. In other words, do the SSD upgrade on your own if you're looking for more storage. To make matters worse, while the SSD does support NVMe, this is Samsung's lowest-performance model, and it's only slightly faster than a good SATA drive. The PM951 uses TLC V-NAND, and that apparently puts the kibosh on raw performance. The 512GB PM951 would perform better, but the 128GB model definitely struggles. Not like it really matters, since 128GB is barely enough room for Windows 10, the periodic updates, a moderate collection of apps, and all your usual documents and downloads. Be prepared to routinely flush out the trash compactors to clean up your C: drive, or suffer the consequences. Performance is as you'd expect, with the exception of ProShow Producer that doesn't seem to appreciate Skylake much. 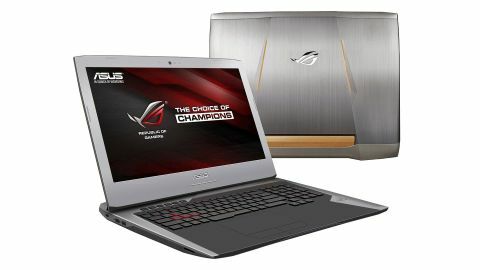 The G752 is faster than previous generation notebooks, and Asus' G752 is easily able to hold its own. Note that the G752 can’t use Nvidia’s Optimus Technology (thanks to G-Sync—more on that in a moment), and unlike the MSI GT72S, the GPU is always enabled. Despite a decent 66Wh 6-cell battery, the G752 checks out at 2.35 hours. Notebook gamers may not expect all day battery life, but GT72S offers twice the battery life of the Asus—note that you do need to reboot to turn its GPU off, however. Asus uses a moderately large 180W AC adapter. We're not really pushing things very hard in the above table, especially for a gaming notebook. Let's look at a wider collection of games, at both 1080p "Medium" and "Ultra" settings. The "Ultra" settings are the same values we use for our desktop GPU testing, while "Medium" is a pretty sizable drop in quality in order to boost frame rates—it's mostly for slower notebook GPUs, as you'll see below. First, the good news: The GTX 970M matches up very well with the notebook's 1080p display, and what's more, the display offers G-Sync so you can run all of our test titles at more than 30 fps and not have to worry about tearing. A few of the more demanding titles can still benefit from dropping a few settings down a notch, but overall this is a great result. The bad news is that after playing around with something like the GTX 980 for notebooks, the GTX 970M looks pretty anemic. Then again, you could buy two G752VT notebooks for the price of the fully loaded GT72S. Dropping to Medium quality, we see just how much legroom the 970M has—all of the games are running smoothly, and six are hitting the 75Hz display's maximum refresh rate. Compared to the GTX 960M in the Acer V17, we're looking at a sizeable 55 percent improvement in performance. Keyboard temperatures while idle at the desktop. Keyboard while playing a game. Hot spot near the screen while gaming. Bottom of the laptop while gaming. Hot spot near the GPU cooling vent while gaming. Concentrate all fire on that Super Star Destroyer! The G752VT is powerful, but what happens when the rebels decide to blow it up—you know, by doing something crazy like running a game? This is where thin and light laptops show their weaknesses; shields quickly fail, resulting in a combination of loud fans and scorching hot spots. The G752 meanwhile keeps humming along with only a moderate increase in fan speeds. The fans stay under 36dB, with thermals mostly below 35C, though the exhaust area can reach a warm 45C under load. You can see several images in the above gallery taken with an FLIR One infrared camera; these were snapped after the notebook had been running a game for over an hour, and it's still doing quite well. Full-size keyboard with 10-key, macro keys, and a large touchpad with discrete buttons. Audio ports, USB Type-C, two USB 3.0, mini-DP, HDMI, and GbE on the right. SD reader, optical drive, two more USB 3.0, and a Kensington lock on the left. Elsewhere, the gesture-enabled touchpad still offers two discrete buttons, and the keyboard supports 30-key rollover anti-ghosting technology—so unless you grow several extra appendages or manage to seat more than three people around the keyboard, you’ll never miss a keystroke. There's no multi-colored lighting, so if you were hoping more for Jedi blue or green instead of Sith red, that might be a problem, but otherwise the user facing elements are good. There are plenty of USB ports, including a Type-C USB 3.1 port, so connectivity shouldn't be an issue. The display is also great, and it’s not just about G-Sync. Yes, variable refresh rates are present and work as expected, but even when you're not gaming, colors are reasonably accurate and the IPS panel has good contrast. After years of seeing otherwise great laptops saddled with mediocre displays, we've finally turned the corner. I also appreciate that Asus elects to keep all connectors on the sides, keeping the back clear so it can do things like expel heat. The rubber stoppers also work as dangling participles. The only oddity is the rubber grommets that come installed on the rear exhausts. Their purpose is something of a mystery, as they don't really seem to do much. The idea is that the cooling has some extra venting area with fewer obstructions, helping to prevent dust buildup, and that's not a bad thing (assuming it works—we generally aren't able to use laptops long enough to have problems with dust). But the rubber stoppers are attached by plastic strings and they just look silly when they're dangling from the system. We suspect most users will cut the plastic cables for the stoppers within the first few weeks of owning the G752, if not sooner. Or maybe they prevent X-Wings from making a run on the exhaust port, causing the whole notebook to self-destruct? The GTX 980’s ability to destroy benchmarks may impress, but it’s insignificant compared to the power of a balanced platform. The GTX 970M remains potent, it’s far more affordable, and G-Sync is arguably more useful on a notebook that can’t routinely hit 75+ FPS. Some of the extras do increase the price, and the lack of a 256GB SSD is disturbing, but provided you’re okay with the lackluster battery life, there are no show stoppers. Those who prefer raw power can still opt for Death Star notebooks sporting GTX 980 or 980M, but the Star Destroyer G752VT is no pushover. Bottom line? Any Sith Lord would be proud to carry this weapon into battle, with its aggressive lines, red/orange accents, and powerful weaponry. Despite the flashy looks, the notebook doesn’t attract any unwanted attention, slashing apart foes while hardly breaking a sweat. Yes, the force is strong with this one. It's so close to greatness, and with a bit more training (as in, an upgrade to a larger SSD after purchase), it could one day rule the universe. Without that training, however, it's more of a fearsome apprentice than an actual master—still dangerous and worth a look, but with a few shortcomings.